PLEASE REVIEW THE FOLLOWING CONDITIONS CAREFULLY BEFORE PURCHASING PRODUCTS FROM Embroidered Image. THE FOLLOWING CONTAINS IMPORTANT INFORMATION ABOUT YOUR RIGHTS AND OBLIGATIONS, AS WELL AS LIMITATIONS AND EXCLUSIONS THAT MAY APPLY TO YOU. Embroidered Image will accept any returns based on faulty goods or incorrect order picking. Should you receive faulty goods or incorrect orders you should notify Embroidered Image Ltd within 24 hours of receiving the goods. 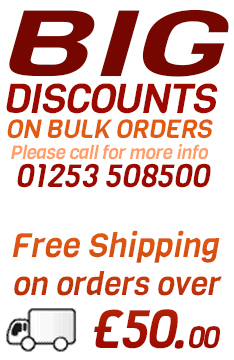 You can contact our returns hotline on 01253 508500 or e-mail sales@blackpool-logos.com When corresponding with Embroidered Image please have your order number to hand or clearly printed on your e-mail along with your full details. Please note that Embroidered Image will not accept products returned which have been branded with a customers name/company logo (embroidered or printed). All returns must be in there original packaging and in a re-saleable condition. Embroidered Image reserves the right to refuse service, to close accounts, to cancel orders, or to terminate affiliate and other marketing programs that it deems harmful to the company. Embroidered Image is responsible for all products until such time that they leave the warehouse and are handed to a third-party carrier for final delivery. Although we take steps to ensure your product has a certificate of posting, we cannot accept responsibility if you, the client, inputs an incorrect shipping address. Any product faults must be reported to Embroidered Image as soon as possible and a detailed account of the problem is required along with a description in which the product/s have been used. Any products returned for sizes incorrectly picked by the customer are chargeable at delivery cost to the customer. Items returned due to incorrect sizing will be subject to 15% handling fee and return delivery cost.